I love wrecks and wreck diving. My home is full of charts and wreck pictures. My bookshelf is full of Lawrence Green, Jose Burman, Jacques Cousteau and George Young books, files of newspaper clippings describing wrecks along our coast and National Geographic wreck articles. I scan the Discovery channel programs for wreck stuff, visit maritime and shipwreck museums where ever I go and I trawl the internet for wreck info quite often. Have you seen Mud Men on the DSTV History Channel (186)? It’s brilliant! If I lived in London I would spend all my free time with those guys. My focus is naturally on wrecks around Cape Town but actually Cape Town is not such an ideal spot because even though we have a fair number of wrecks, our seas are too rough for wrecks in shallow water (as most are) to survive for long. Those in deeper water are often too deep. Still, I like it here. For me, the allure of wrecks is limited exclusively to wrecks that are yet to be found or are very seldom dived. I can think of nothing more mind numbingly boring than diving on a wreck like the Thistlegorm in the Red Sea. The thought of being part of some kind of guided tour over anything which has been “explored” by literally hundreds of thousands of divers would drive me to insanity. Its really not “exploration” at all. It doesn’t matter how good it is – it’s not for me. The only Thistlegorm dive I would have liked to do was the one when Jacques Cousteau and his divers found and dived her in 1953. The story of that dive (in Cousteau’s book The living Sea) is a very interesting read. Anyway, rather give me a bit of twisted metal in cold dirty water, as long as there is a mystery to solve and I can be the first to be there to do it. 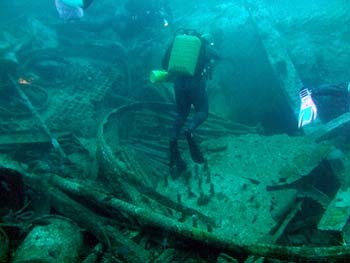 Here are some of the wrecks that we have found so far: I say “we” because in most cases I was not diving myself. That’s because most of the time I’m skippering the dive boat and controlling the search from the surface. Anyway, finding wrecks is a team effort and I really appreciate the effort of all those divers that have assisted over the years. It’s not easy and quite often there is a lot of swimming and not much finding! The first wreck I found was a small barge at Ark Rock near Simon’s Town. That was in my shore diving days (mostly solo) in the nineties, before I had my own dive boat. The Ark Rock area seems to have been some kind of naval dumping ground for barges, tugs and working boats of World War 2 vintage. We subsequently discovered another 5 small wrecks and many dumped boilers close by. Also in the area is the Parama (1862) which we found just north of the rock. Dave Couperthwaite lead us to the position. She had most likely been found and dived before but has unfortunately never been properly surveyed. Details of what is currently known about these wrecks can be read here. The Glencairn Quarry Barge was another one that I searched for from the shore but only found when I took some divers from the Triton dive club to the area with my first dive boat, the Blue Flame. Peter Lucas of Triton found her. The barge had been found and dived many years before but before nothing was recorded. What is now known about her can read here. The SAS Gelderland was one that took a whole lot of swimming in cold water to find. Jeff Corbett and Anton Borruso eventually found her. I had taken Ken Evan of Circe Launches out there as he had been involved in a dispute over ownership of the vessel and had been present when the navy blew her apart to settle the dispute. They literarily blew her apart – she is in 2 pieces about 85m apart. Ken’s recollection of the position was fairly useless, hence all the swimming, but he did give me some interesting info on other wrecks in the area. 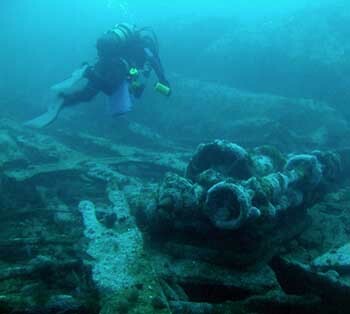 The wreck is a great dive, read about it here. 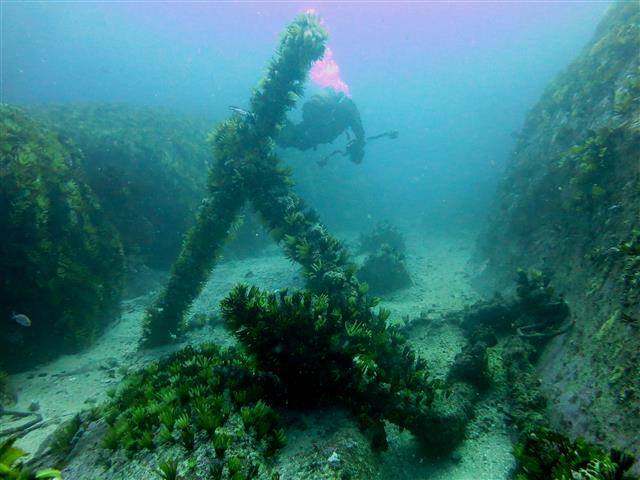 While diving around Phoenix shoal looking for pieces of the Phoenix we found 2 Ammunition Barges (1940s). More naval junk? Perhaps, but when they sank these 2 they seem to have left some major ammunition pieces inside. We found anti-submarine mortars just lying about!. Ammunition disposal regulations must either have been quite slack or more likely some seaman took a shortcut. The site is described here. The P-87 is a wooden naval patrol that we found quite easily with a towed diver search. I think we were the first to dive her but there was not really much to see. Unfortunately there was also very little information available to document the wreck. The wreck site is described here. Richard Duckitt was the diver that told me about a yacht he had seen on Tafelberg Reef but he didn’t have a position for her and it took quite a lot of swimming to find it again. Fortunately it is very beautiful reef to swim over so there were always divers willing to dive the area. It was 2 ladies from Triton dive club, Jill Timoney and Ros Morgenrood that found it again from my boat. I found out her name was Patti and now she is often the starting point for dives on the southern part of Tafelberg Reef. The wreck site is described here. Jean Tresfon and I found the MFV Afrikaner (1993) with his magnetometer. We had just concluded an unsuccessful search for another wreck and decided to give the Afrikaner a go on the way home. At 56m she is a trimix dive and nothing really special but worth a visit for tech divers. Muizenberg Trawlers. Two trawlers were scuttled off Muizenberg in the 1970s. We have found and dived them but I have been unable to establish their names or much detailed info on them. They seem to be of a similar era to the Princess Elizabeth and Oratavo at Smits and the Godetia off Macassar. To research all those old trawlers (in conjunction with I&J) and publish a report would be an interesting project. Perhaps someday I will have the time or perhaps someone else will take this on. 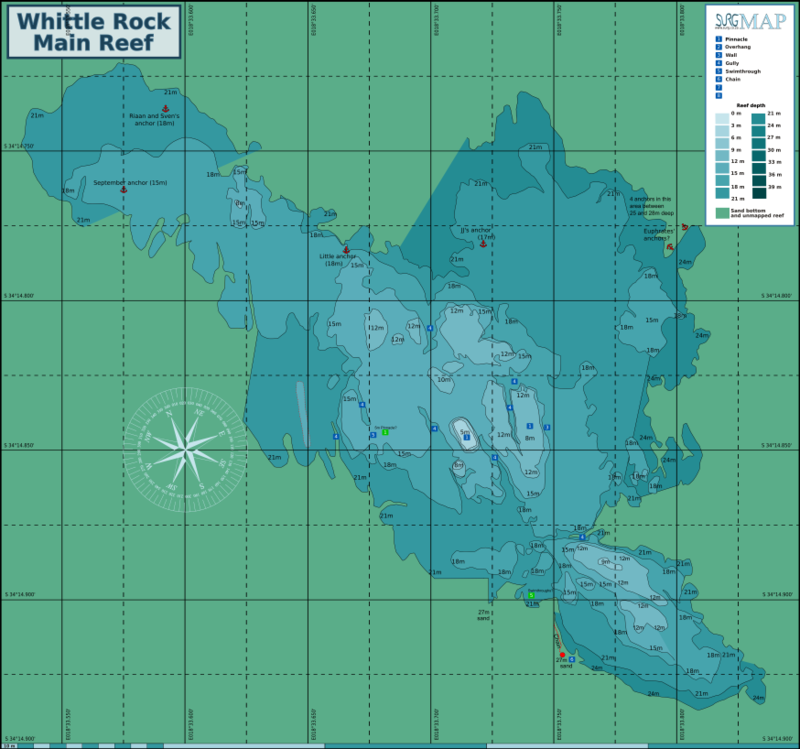 The wreck sites are described here. In September 2015 we found the Star of Africa (1880) after many years of searching for her whenever we dived at the Albatross Rocks wrecks. I will in due course write and article about the Star and her discovery. In December 2016 we found a steam trawler south of Robben Island at 36m. Her identity is still a mystery and we will return there in the summer/Atlantic diving season 2018 to properly map and photograph her in an effort to identify her. In August 2018 we found, mapped and photographed the I&J steam trawler Godetia which was scuttled off Macassar in 1970. The Lusitania and the wrecks at Albatross Rocks used to be the exclusive haunt of the old local wreckies – Until I came along. They can only be dived in very good conditions and can be quite challenging as dives. The Lusi is deep and right up against the mighty Bellows Rock and the Albatross wrecks are very shallow, hectically surgey dives and a long way from boat launching facilities. When I started diving these wrecks and taking dive charters there, I really upset those old guys. (I suppose “old” is relative, I’m no spring chicken myself.) Anyway, I used to get phone calls where I was warned that it was way too dangerous for us to be diving there and we really should leave them alone. What absolute twaddle! It was blatantly obvious that their only concern was that we might make off with loot that they had been collecting undisturbed for years. We visit these special wrecks a few times every year and I normally only take along my regular divers as a kind of loyalty reward. So if you would like to dive them with me then you will need to join a few of our more regular dives first. I really love diving those wrecks and have immersed myself in their history. There is just so much to explore and discover. Here is a strange and thought provoking irony: 20 or 30 years ago you could go out to an old wreck and blast it to bits with dynamite in order to get at the non-ferrous parts and valuable cargo. That’s was fine, no problem, a good honest way to make your living. Nowadays, if you dived on the same wreck and came upon an intact teacup which you brought to the surface to be restored and go into a collection of artefacts you are liable to be charged with a serious offence and labelled a wreck looter. It makes no difference if your only motive is to promote maritime heritage – you are a criminal! It’s just more non-sensical, over-regulatory, beurocratic twaddle! I personally refuse to be maligned for adding a teacup to an artefact collection just because the authority responsible has no reasonable common sense method or system of separating ethical behaviour from unethical self-enriching plunder. We need to be mindful of the difference between salvage, which is essentially the recovery of ships cargos and scrap metal, and artefact collection. The former is applicable only to wrecks younger than 60 years and is supposed to be controlled by SARS (South African Revenue Service) through a permit system. The latter is the concern of SAHRA (South Africa Heritage Resource Agency). Although both salvage and artefact collection take place all the time I can assure you that only a miniscule amount of what is actually going on is properly controlled by those authorities. Unfortunately the whole situation is essentially out of control. I wish it weren’t because our maritime history and heritage is being lost but until those authorities can get their act together and put in place workable systems for divers like me to be involved in a solution the situation will persist. This bottle of port (still sealed but unlikely to be drinkable) with the inscription “E.V.W. 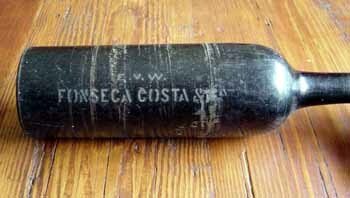 FONSICA COSTA” was found on the Lusi. The Fonsica wine estate in Portugal is still producing port and I established contact with them. An interesting story emerged about how the Fonseca estate was battling to establish itself in Mozambique and Angola against competition from South African wines and ports. This shipping line crest is on a dinner plate found on the Lusitania. 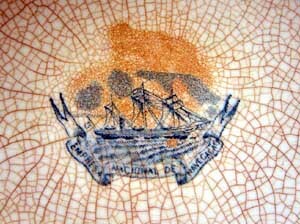 The Lusi was operated by the Portuguese shipping company Empressa Nacional De Navegacao and most crockery found on the wreck has this emblem with the company’s name. However, we once found a soup bowl with the inscription “Empressa Insulana De Navegacao”. That’s a different shipping line so how did that bowl come to be on the Lusi? Research into Portuguese shipping of the time shows how they had several lines, mostly semi-nationalised, with each line focusing on a particular route and ships being sold between lines quite often. I formed the opinion that there was a whole lot of administrative bugling and dodgy dealing going on which is probably why they could never really compete with the British lines. Of course it didn’t help that they lost two of their finest ships (Lusitania and Lisboa) within 4 years, both on the South African coast and both due to navigational errors. The SS Umhlali which wrecked at Albatross Rocks in 1909 carried a cargo of general cargo which included all sorts of building materials and consumable goods. 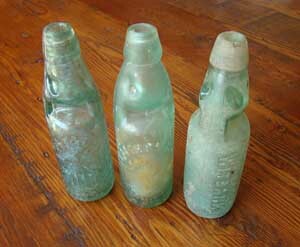 Divers often find intact soda water bottles with inscriptions at the wreck site. They are known as Codd bottles after a British inventor Hiram J. Codd registered a patent in 1886 for a unique method of closure in a bottle using a glass ball and an “elastic” ring. These bottles were made at various UK glassworks under various patents for numerous mineral water bottling companies in South Africa. Local collectors are always on the lookout for ones with rare inscriptions. I’ve seen ones from Kimberly, Johannesburg, Witbank, Boksberg, Springs, Germiston, Krugersdorp, Oudtshoorn, Pretoria, East London, Cape Town and even Cradock. Imagine running a mineral water bottling company in Cradock in 1909 and needing to specially import glass bottles with your company’s inscription from the UK! The Umhlali was headed for Durban from London so these bottles were most likely new stock on order from bottling works all over South Africa. Once they reached their destination (if the Umhalali hadn’t wrecked) they would have been filled locally and were then returnable for a deposit. So in theory the bottling company would not need to keep buying new bottles. The downfall of the business model was that naughty schoolboys would break the bottles to get at the glass balls which they could use as marbles – to hell with dad’s deposit! 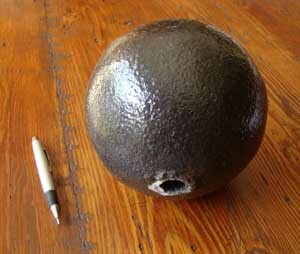 This cannon ball was found close to the remains of the Phoenix (1826). It’s very big and heavy but what really got me interested was the fact that it is hollow with a hole for some kind of fuse. Is it a cannon ball or some kind of bomb? Some research showed that cylindrical iron cast shells, filled with gunpowder and fired from smooth bore cannon/guns were fairly common from about 1770 to 1870. Exploding ordinance was first used much earlier by the Venetians and Ming Dynasty Chinese around 1370. The Phoenix was built in 1810 and wrecked in 1829. She was a merchant vessel but would most likely have been armed with a few guns as was common at the time. However, the high calibre (200 mm) of this particular shell seems a bit excessive for the self defence of a merchant ship so perhaps it came from the nearby shore gun battery at Martello Tower. The battery was built in 1779 and was active until 1871 so the dates fit but then it would have been one that didn’t explode after firing. Its exact origin remains a mystery but one can certainly learn a whole lot about shells and guns if you try and solve the mystery. At Maidstone Reef, or a section of it we named Anchor Reef, Peter Southwood found a huge (6m long) admiralty pattern anchor. Where did that come from? Well, a bit to the north we were dissapointed to find a promising wreck-like sonar contact was in fact just a very rectangular rock. But, we found a nice old milk bottle, a lump of coal and a piece of crockery with a P&O (Peninsular and Oriental) shipping line crest on it. A spot of internet research revealed that the British P&O shipping line had links to the town of Maidstone near London and that some of their steamers may well have called at Simon’s Town. Did one of them loose that anchor and shed some crockery at this spot? Mmm, it’s possible but there was also a HMS Maidstone which docked for repairs in Simon’s Town in 1945 and that seems a more likely explanation for the name of the rock. We have done a lot of diving around the Maidstone Reefs and Ark Rock but there is still plenty of exploring to be done in the area. Several large admiralty pattern anchors like the one in the photo above have been found on the reef. I reckon 2 or perhaps 3 of those must have come from the Euphrates but what about the others? One theory is that the pinnacle may have been marked with a buoy which could have been anchored with such an anchor. But then surely the anchors would be quite close to the pinnacle and not several hundreds of meters away from it as a few of them are. So is there another explanation? Perhaps another wreck lost there without a trace and still waiting to be discovered. I have many more of these stories and I am sure there are other wreck divers with many of their own. Wouldn’t it be great if there were somewhere that we could publish these little bits of research linked to an internet shipwreck database? By linking dive reports, articles, underwater pictures and artefact collections to a database it would become a true treasure trove of historical information. It could even become a valuable national asset. Much better than the “dead” list we have at the moment. That list, the so called “National Wrecks Database” (MS Access) is really just a slightly embellished update of a wrecks list compiled by Feddie van den Bosh in the ninties. How is it that SAHRA could spend millions to just copy and embellish a list that was produced by a private individual for free? Come to the party SAHRA – its your responsibility. About 10 years back I noticed in Turner’s book a diagram of a magnetometer trace with a wreck indicated as the “Highfields”. It seemed interesting but the only info I could find on her was the bare basics of date, name and approximate position. Speaking to some the old salt wreck divers I found out that she lies at the entrance channel to the Cape Town harbour and diving her is therefore quite tricky. A challenge like that I can’t resist and being the first to properly survey and document her would be great. But where to start? In 2005, out of the blue, I received an invite from Dusky Divers to dive her – strange that, I have never been invited to join a charter before or since. Anyway, myself and Anton Borruso jumped at the chance. The skipper was none other than Alistair Downing – now of Underwater Explorers fame. We noted the approximate position of where we dived but conditions were not good and decided to return with our own boat to have a better look. We spent some time at the national achieves where we found newspaper articles which had better info on the ship itself and described the sinking in detail. 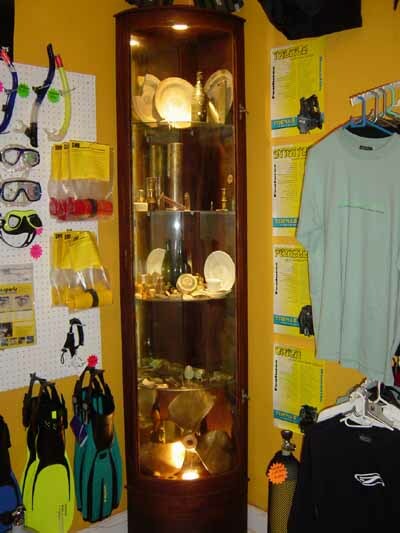 At the time we were collecting artefacts from our favourite wrecks and displaying them at Pisces Divers (then on Kloof Neck road) in an antique display case. I was very proud of this artefact collection which had a separate shelf for each wreck. Many interesting discussions on wrecks were held around that display case and dives were planned for local wreck divers interested in exploring and documenting our wrecks. Well, someone must have taken offence at what we were doing because one day when we returned from a dive on the Highfields we were greeted by a SAHRA official wanting to search the boat. Off course we obliged but when a wooden block (pulley) and a brass letter were found in Anton’s goodie bag both of us were charged with contravening the national heritage act. We plead guilty but still had to appear in court to be sentenced. SAHRA then seemed to completely loose interest in the case and we found ourselves in a position where neither the prosecutor, the judge or us (defending ourselves) knew what to do and everyone just wanted the case to go away. Nobody, except Anton and I, knew anything about the Highfields and she was not documented anywhere. Can something be considered national heritage if nobody knows about it? In the end we paid a small fine and that was that. I remember the judge asking us how much cash we had on us so that he could make the fine that amount so that we wouldn’t need to go to an autobank! We were actually quite doff to admit guilt as if we had pleaded innocence the prosecution would have needed to prove that the artefacts came from a historic wreck which they would not have been able to do. At that stage Mike at Pisces decided he would rather not be be involved with artefact collection and the display case was dismantled. The artefacts went into other collections. Take a look at the Highfields article on wikitravel here. The article was written largely with info that I supplied and the wreck has been mapped and described by diving her from my boat. I think it’s a stunning article and an example of how all our wrecks should be documented. Now ask yourself: In the case of the Highfields wreck, who has done more to document and promote maritime heritage? SAHRA or me? Mmm, SAHRA 0, Pirates 1. BlueFlash is going to continue wreck diving, searching for new wrecks and uncovering the history behind or wrecks whenever we get the opportunity. Unfortunately the time demands of running a profitable business and the increases in the petrol price have lead to us needing to be more selective of when we can go wreck hunting but the passion is still strong and I’m always itching to get out there. I have my sights set on a few missing wrecks and there is a heck of a lot of work to be done to improve the wikivoyage (Diving the Cape Peninsular and False Bay) wreck site articles. 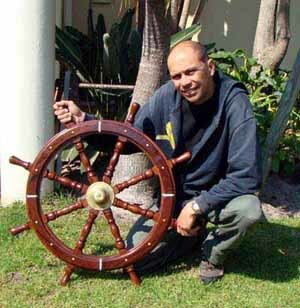 I am committed to getting that web info to be the best resource on Cape Town’s wrecks with Peter Southwood who is the main author of those articles. I realise this has been a bit of an anti-SAHRA rant but honestly I reckon they deserve to get a bit of stick here. Cape Town has a pathetic maritime museum (not really worth visiting), the multi-million rand wrecks database is just a dead file and there is precious little wreck preservation and documentation work happening. The NAS (Nautical Archaeological Society) courses which they run every few years have never amounted to anything more than promises of co-operation with keen divers which are never fulfilled. I find the whole situation quite distressing. Fortunately I’m a positive person and I recognise that the vast majority of divers and people involved with wrecks these days recognise the need for responsible preservation of our maritime heritage. I am confidant that in years to come we will look back at this time as being the bad old days before SAHRA and local divers got to working together.